Now you can manage your entire campus, from classrooms to athletic fields, from entire facility to individual piece of equipment, with one look. 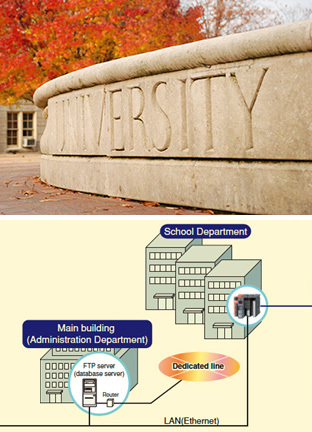 Our campus-wide energy management solution for K-12 schools and universities gives you a single view of energy consumption and unparalleled control. You can understand power consumption by facility (e.g. gymnasium) and equipment (e.g. transformer), monitor operating status of equipment, eliminate the need for meter-reading work, and correlate energy use with building automation systems and weather. Now you can let your entire team see energy-consuming activities and respond. Our EcoWebServer III is a simple, convenient and compact energy-saving data collection server. It provides “visible management” to ensure simple and effective energy savings. Its convenience, simplicity and effectiveness is unmatched. Use web browsers to display measurement data in graphs. Functions for sending and displaying data on the web are pre-installed in the main unit of EcoWebServer III. An HTTP server function is incorporated, allowing the collected data to be uploaded to Internet/Intranet via the Ethernet. Transfer data automatically and send e-mail notifications. You can add a separate e-mail server or database server to receive e-mail notifications of abnormal readings. You can also transfer data automatically and measure data storage in CSV format. Obtain consumption data in reports and as a dashboard utilizing our AX Energy software for energy management.